In spite of what some Californians believe, wine was not born in Napa Valley. In fact, the eastern Mediterranean, of which Israel is a part, is the birthplace of wine. The very first thing Noah did when he got off the ark was to plant a vineyard. Wine figures prominently in the Bible and was widely used in the region both privately and as a part of the ancient Temple ritual. Wine in fact provided a major export industry for ancient Israel. Archaeologists have discovered sealed vessels of wine on sunken ships in the Mediterranean Sea right off the coast. And ancient stone “gats” (Hebrew for wine press) sit amidst current grape vineyards in today’s Israel. So, we know that wine has been made in and around Israel for thousands of years. (By the way, I understand that a 30-minute plane ride from Israel on the island of Cyprus, they’ve discovered wine artifacts more than 5,500 years old!). In the 6th and 7th centuries, when the Muslims conquered the area they destroyed all of the ancient vineyards. In the process, any indigenous grapes in Israel were apparently permanently lost. Only in the late 1800s with the encouragement of philanthropists like Sir Moses Montefiore and Baron Rothschild did Jews return to Israel and begin to work the land. But the wine produced then was sweet sacramental wine, not the drinkable dry table wines we expect from a quality wine region. In the 1980s, with a push from some California experts who realized that Israel was in fact ideally suited for wine production thanks to its climate and geographical position, a quality revolution began, led by the Golan Heights Winery. Many Israeli wines now compete nicely internationally. In the last year alone in the US, serious wine critics are paying special attention to Israeli wine. And for the first time, through companies like ours, non-kosher Israeli wine is being imported into the US, with hopes of reaching a broader serious wine-drinking audience. While still in sort of an odd infancy in spite of an ancient history, today’s quality Israeli wine is the future of wine history. 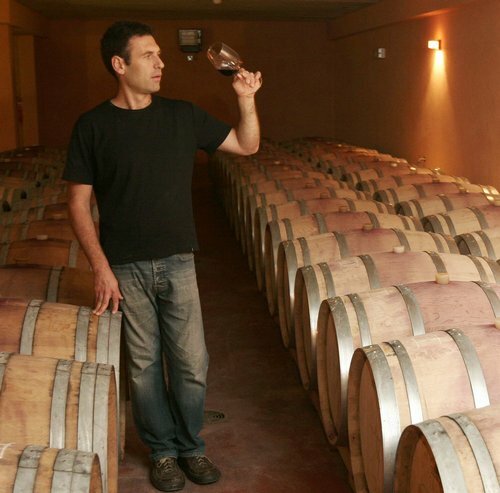 Many of the youngest, most successful Israeli winemakers today, like Golan Flam pictured above, are training abroad in the latest advanced winemaking techniques, then bringing those skills home in combination with an ancient wine land situated right on the sweet equatorial spot. Today there are more than 150 wineries in Israel. The next post will focus on the handful of organic wines produced in Israel. Israeli wines are probably the most underrated in the world. They are incredibly tasty, and these days very well-balanced. With Californian and Israeli wines, who the heck needs French wines? The only wine from outside Israel and the USA worth the bother are possibly spanish and italian wines. However, the generous sunshine give Californio and Israeli wines that special edge, the dot on top of the “i”. By the way – for readers living in or around Napa or Chicago… Israeli winemaker Golan Flam will be with me for wine tastings in both places in June. Let me know if you want to attend either one.